In ancient times, Greece wasn't a single country like it is today. It was made up of lots of smaller states. These states were always squabbling and often went to war. Sparta and Athens fought a long war, called the Peloponnesian War, from 431 to 404BC. Only the threat of invasion by a foreign enemy made the Greeks forget their quarrels and fight on the same side. Their biggest enemy were the Persians, who came from an area around modern day Iran. The Persian kings tried to conquer Greece a few times between 490 to 449BC, but the Greeks managed to fight them off. In the end, it was the Greeks who conquered Persia, when Alexander the Great defeated the Persian Empire in the 330s. The backbone of the Greek army was the 'hoplite'. He was a foot soldier, who fought with a long spear and used a large round shield for protection. 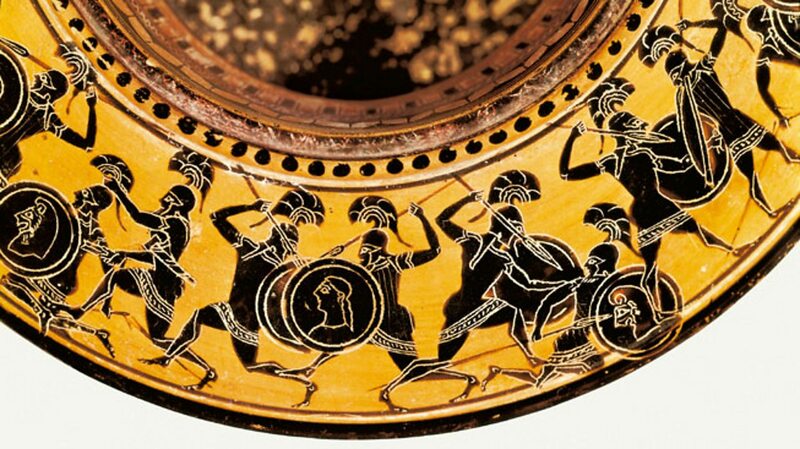 In battle, hoplites fought as a team. They lined up in ranks and locked their shields together with just their spears pointing over the top. This formation was known as a ‘phalanx’. Enemy soldiers saw only a wall of spears and shields moving towards them. It was tough to break through once a phalanx started marching forward. The Greeks had archers and cavalry too, but it was the phalanx that won many famous battles. 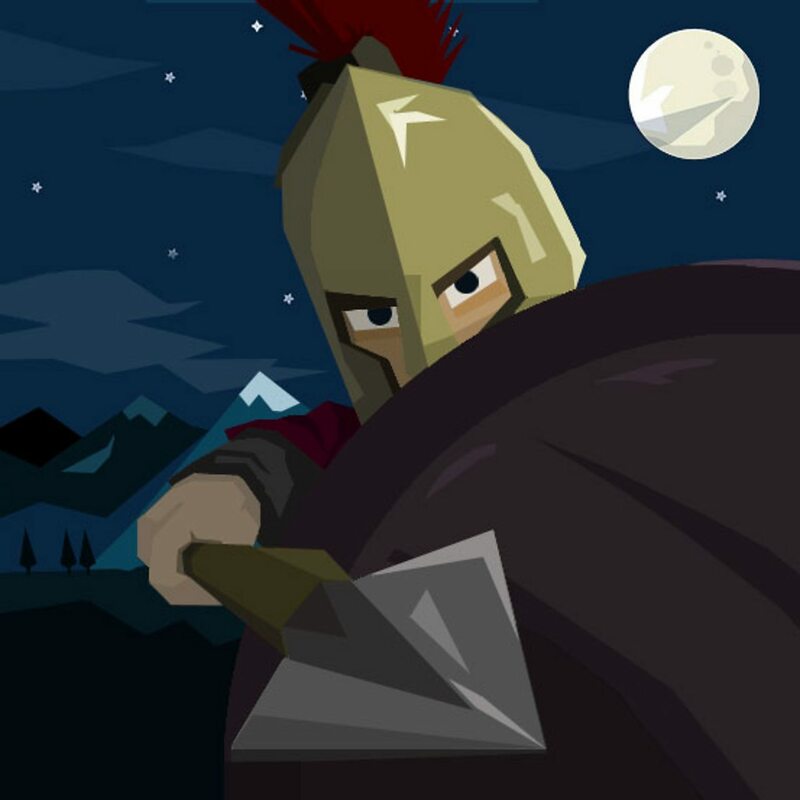 A hoplite had to pay for his armour himself, unless his father was killed in battle. Then he was given his father's equipment. Fighting wars was what the Spartans did best. Greeks said that in battle one Spartan was worth several other men. The Spartans believed that strict discipline and a tough upbringing was the secret to making the best soldiers. Boys left their families at seven to begin their 23-year-long training to become a soldier. Only those who went through this gruelling training system were considered true Spartan citizens. It was a hard life. A boy was only allowed one tunic and had to walk everywhere barefoot, even in cold weather. They weren’t given much food either, so often had to steal. Girls were expected to be physically fit too. They weren't allowed to be soldiers, but they did compete against the boys at sport. Spartan women also had more freedom than other Greek women. A wife ran the family farm and gave orders to the slaves (known as 'helots'). Spartan mothers told their sons before they left for battle, "Come back with your shield, or on it." Dead Spartans were carried home on their shields - only a coward would drop his shield and run away. Spartan soldiers wore red cloaks, so bloodstains wouldn't show up. They also grew their hair long and would comb it before going into battle. Greek warships had oars as well as sails. The largest warships had three banks of oars and were called ‘triremes’. A trireme needed 170 men to row it - one man to each oar. It was steered by long oars at the stern or back of the ship. Fixed to the front of the trireme was a sharp metal ram. 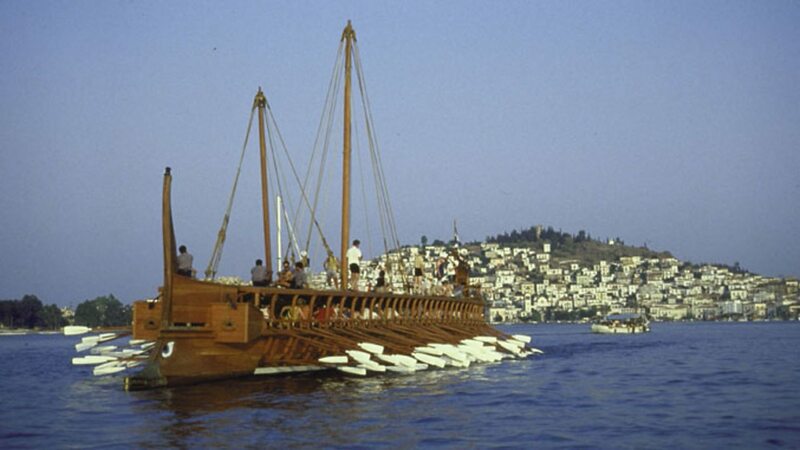 In battle, the triremes tried to get close to the enemy ships, and if possible crash into them. When the trireme struck the side of an enemy ship, the ram smashed a hole in the wooden planks. Water flooded in and the damaged ship either sank or had to be beached on the nearest shore. The trireme's soldiers sometimes jumped onto a damaged ship to capture it.